In large bowl, break up cookie dough. Stir or knead in flour until well blended. Reshape dough into log. If too soft to cut into slices, refrigerate up to 30 minutes. Heat oven to 350°F. Cut dough into 16 (1/2-inch) slices. On ungreased cookie sheet, place slices 2 inches apart. Bake 12 to 14 minutes or until golden brown. Cool 1 minute; remove from cookie sheet to cooling rack. Cool completely, about 15 minutes. 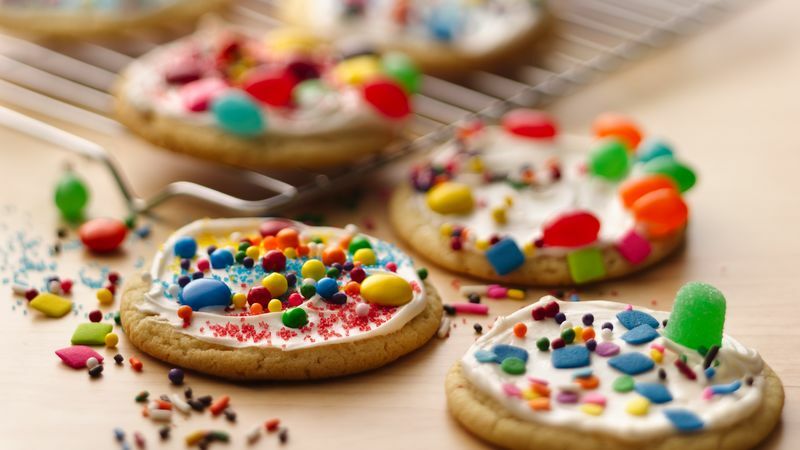 Spread frosting over cookies. Decorate as desired with assorted candies and sprinkles. For more accomplished cookie decorators, create geometric patterns with slivered almonds, raisins and chocolate chips.